The reindeer herders of Russia’s Kola Peninsula struggle in solitude against the Polar night, the wind and fatigue. The flat-topped hills and boundless tundra of the Kola Peninsula resemble the landscapes Ray Bradbury describes in “The Martian Chronicles.” This may be part of Russia, populated by Russians, but the local residents live in houses built on sleds and often walk through a wind that blows so fiercely that it can carry a dog away. When they look up, they see a crimson sky – when it isn’t completely dark. To the east of Lovozero, on the coast, is Gremikha – the “village of flying dogs.” The only way to the village is by water, and only then if the weather is good. In winter, the blizzards and sea storms may keep visitors stuck there for weeks. The strong winds can carry off dogs or small animals, and when the weather is really bad, people have to cling onto metal handrails that line the pedestrian footpaths that run through the whole settlement. Located in the center of the Kola Peninsula, the town of Lovozero, which the younger generation of residents affectionately calls Love-Ozero (“Love Lake”) is the capital of Russian Lapland. The district by the same name is the largest, yet most sparsely populated district in Murmansk Region. Compared with Gremikha, Lovozero can be called a quiet little hamlet in the tundra. Tatyana and her husband Valery live in a small wooden house held together with resin. Jars of canned cloudberries and cranberries line the walls. When she has to go outside, Tatyana wears a reindeer-skin coat. Reindeer stew is also a common meal for the couple. These visible ties aren’t the only things that bind Tatyana and Valery to the reindeer. 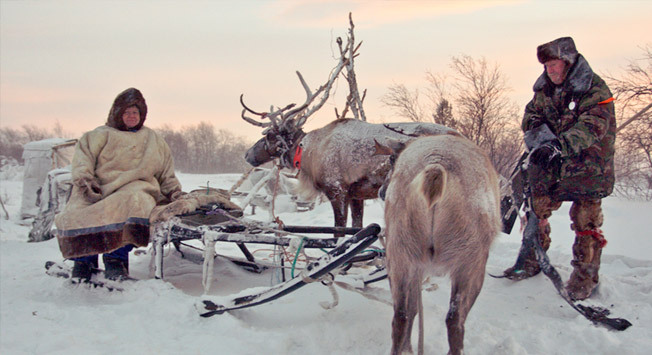 They are Komi – a semi-nomadic ethnic minority native to the Russian north, and following the deer is in their blood. Their friend Misha has other ideas. “Do you know why the reindeer herders don’t want to move back into town? It’s because they know that if they relocate, they’ll hit the bottle. People turn to booze rapidly in Lovozero. Boredom, cold and lack of money – life is tough,” Misha said. Misha prefers to travel by snowmobile. During the winter, he organizes sledding and snowmobile trips, while in summer, he heads off on treks around the Kola Peninsula. Sometimes he brings tourists to reindeer-herding families, who give the tourists rides on the reindeer for a small fee. “The tourists come mostly from Russia, Scandinavia and the U nited States – fans of extreme conditions. No one turns up here by accident. Of course, you need to prepare for the trip; not everyone can live in a teepee or ride 13 hours on a snowmobile. But there’s a romance to things here. The landscape here is as though you’ve landed on a different planet,” Misha said. The mentality of the reindeer seems to have migrated to the population of Lovozero. While few people ever move to the town; few people leave. Something - fatigue, the fear of any other kind of life, the need to stay with others of like mind - holds the population stable for the moment at 2,828 people. Russian government statistics suggest that there are 47 low-population ethnic minority peoples in Russia, including the Saami and Komi of Lovozero. Many of these peoples are dying out, numbering just a few dozen people only. Most indigenous people live in the Russian north, including Kamchatka, Chukhotka, the Yamal-Nenets Area and Sakhalin. There is a legal framework in place in Russia to protect the rights and way of life of the indigenous peoples of the North. Over the past 15 years, three federal programs have been put in place to help improve the life of native people. Hammond Innes “Maddon’s Rock” begins during the time of the Arctic convoys in World War II and talks about life on the Arctic Ocean.